The basic idea was to preferably get your group to face the opposing group in good order and eager for battle. Most preferably when the enemy were in disorder and not so eager for battle. Medieval saga literature raises the term 'fylking' for battle formation but this is nothing more than 'foulkon' - close combat order - from Maurice's Strategikon given in the northern vernacular. The authors even seem to have difficulty reconciling this classical word with their native 'skjøldburg' - shieldwall, to the point of tautology. Alfred the Great gives us a good example of the importance of these deceptively basic but none-the-less vital considerations from his conduct at the battle of Ashingdon 871AD. 'Alfred and his men arrived at the battlefield sooner and in better order. The extreme consequencs of approaching the enemy in disorder are illustrated by the fate of a Frankish militia in battle with vikings near Prum in 882AD. If two shieldwalls met it became largely a trial of strength and initiative between the two sides. The best men were in the front rank. This was essential for several reasons. First, the group should put on a resolute, brave and aggressive show in the approach to battle. The sight of an oncoming enemy led by a rank of shrinking violets would only serve to encourage one's own group , that should not be allowed. Second, the best men would deal out as much death and destruction as they could in the opening moments of the battle while they were still fresh. If not faced by fighters of similar ability then the carnage they would cause in the other side may lead to its collapse by disorder and demoralisation before they even had to meet serious opposition. Thirdly it was these experienced and battle-wise warriors who could sieze oppurtunities presented by a wavering line or gaps appearing amongst the enemy. Timid or ineffective warriors would rather stay safe in their own shieldwall than step into the enemy with the aim of breaking their formation. How far individuals could effectively wield their weapons as two shieldwalls met was very dependant on the degree of freedom they had to do so. Uneven ground, battle-shy men and 'waves' propagating through the throng as the advance was now faster , now slower here and there would lead to areas where men were packed side-by side and unable to swing or sweep with their weapons. Often it would have been as much as a man could do to stay behind his shield, grip his spear and stay upright, much less try to kill an opponent. In such a close throng of battle there could even have been the kind of 'press' that occurred in hoplite battles in classical Greece. The press was a shoving match where the mens' bodyweight was transmitted through their shields and was supplemented by the following ranks pushing from behind. Occasionally supplemented by stabbing spears and slashing blades when possible this press could push over an opposing line leading to its ruin or just send it reeling back to give enough space for the combatants to take up a more conventional stance again. The degree to which the shields in a press could tolerate such stress or be used in this way was limited by their light construction - not as robust as a hoplite's aspis, and by the danger presented by getting jammed too tightly to defend one's self. The 'King's Mirror' of 13th century warns of the danger of getting the right edge of one's shield trapped behind the left edge your neighbour's. A man thus boxed-in could be killed by an enemy with a long reach seeing his chance in the scrum. The front-fighters would be aided by those behind and around who could reach to do so. 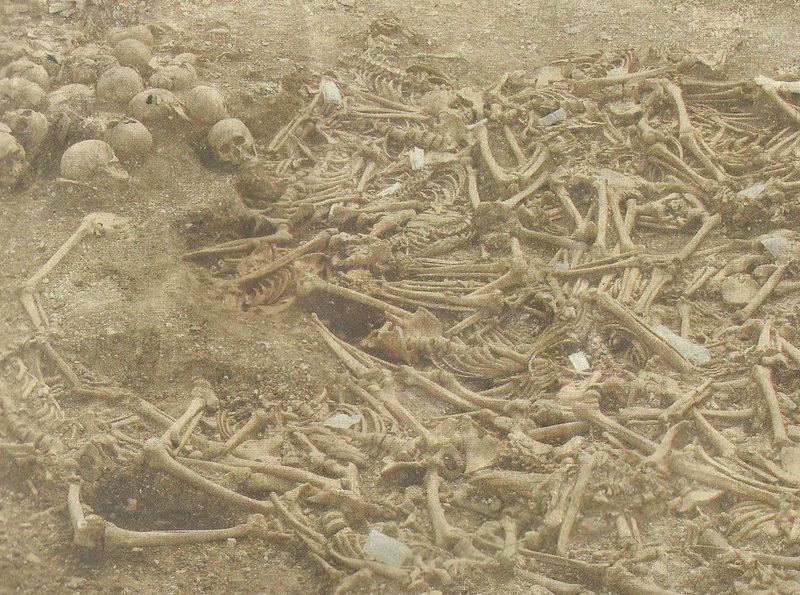 This was the job of neighbours in the front rank who saw their chance, long spears from following ranks that had the length to stab out beyond the front rank. 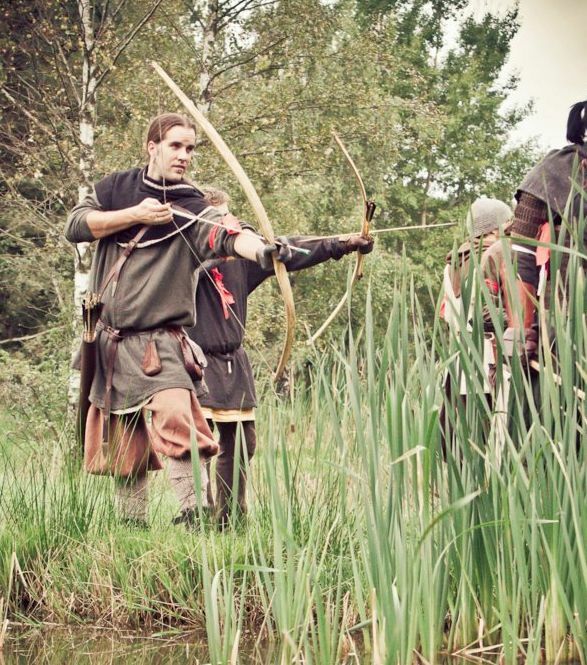 Men with bows or throwing weapons who waited for their chance with arrow nocked or missile poised to throw. 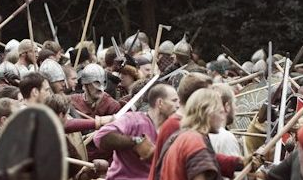 Shieldwall combat gives a recogniseable situation when one side is defeated. If one side can no longer maintain its shieldwall then it will break up into segments while the others are still a single mass. This would be the signal to flee unless one was bent on going down heroically. The segments of a breaking shieldwall would be successively surrounded and cut down by the still-coordinated winning side.